Guess Which Country Has The Biggest Increase In Soda Drinking : Goats and Soda It's Cameroon, closely trailed by Vietnam and India. Sugary fizzy drinks are making inroads in the developing world. 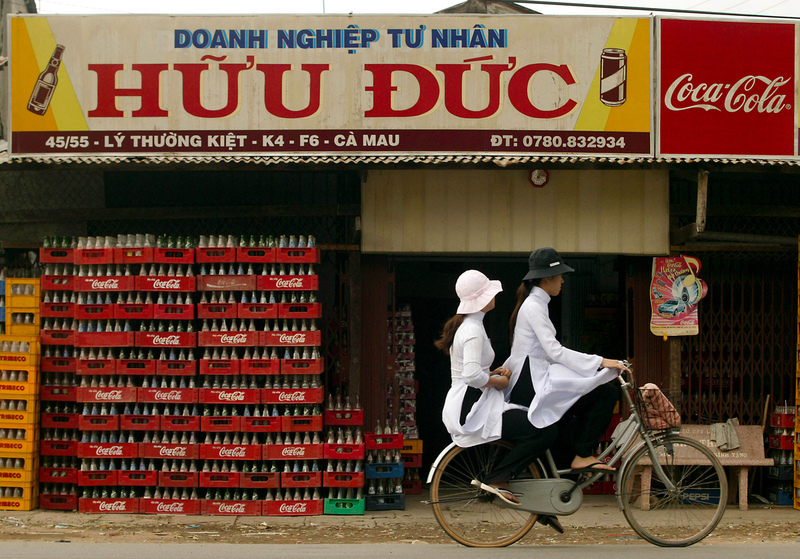 Vietnam is seeing an increase in soda drinking. Soda is at the crossroads. The U.S. is still a world leader in taking the pause that refreshes (and causes weight gain). But soda drinking is flat or declining in the West. The reasons are many: Health consciousness. Bottled water. Energy drinks. So the Big Soda companies are spending money to develop new markets in low- and middle-income countries. In some of these places, people are earning a bit more than a few years before, so they have more money for soda. Health advocates aren't happy that soda consumption is going up in Africa, Asia and Latin America. They would like to see the sale of soda go down because it's pretty well documented that soda just isn't good for you. New data suggest that Mexico's tax on soda may be one way to get people to drink less soda. (Check out this post from The Salt.) Other countries, including Chile, are considering a similar tax. But a soda tax won't necessarily lead to a reduction in consumption. "Soda companies could reduce their prices and absorb the tax," points out Dr. Bruce Lee, director of the Global Obesity Prevention Center at Johns Hopkins University. And there isn't always another drinking option. "In many low-income countries, access to clean drinking water is limited, so soda becomes a viable alternative," Lee says. "People will say, 'We don't have anything else to drink.' "
One way for countries to address this issue, he suggests, is to levy a soda tax as Mexico did, then use the proceeds to bring clean water to people via aqueducts, water purification systems or better sanitation so water sources aren't contaminated by human waste. But it's tough to convince soda drinkers to give it up. People's habits are influenced by "what everyone else is doing, what's available, what's cool and hip," says Lee. Plus, it's easy to drink a lot of soda because it doesn't make you feel full, says Steve Gortmaker, who directs the Harvard School of Public Health Prevention Research Center. With some foods — whole grains, salad — you get a feeling of fullness. With soda, "your body doesn't sense it's getting all these extra calories," he says. "And you consume it so rapidly, a couple hundred calories in a couple of gulps, your body hasn't had a chance to react to it."